With today being the last day of the 2012-2013 college basketball season in what should be an entertaining national title game between Michigan and Louisville, let’s take one last look at some Mountain West basketball stats. Last week I broke down the plus minus rating for each individual UW player and today we move on to a snapshot of the entire Mountain West conference. The focus today will be team offensive and defensive efficiency. This statistic is the great equalizer as it summarizes how efficient a team is in both scoring offense and scoring defense no matter their style of play. Each team’s points per possession offensively and defensively is calculated for 100 possessions allowing for team to team comparisons to be made. For a little more info on this statistic and its usefulness, see the top portion of this article. Now on to the stats. 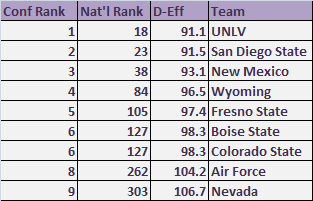 In the just completed season Wyoming had an offensive efficiency of 99.6 which slotted the Cowboys eighth in the Mountain West and 218th nationally as shown above. This was a slight downgrade from last season where the Pokes had a 101.6 offensive efficiency. 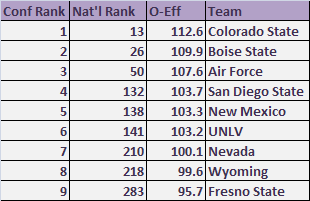 Colorado State and their senior laden team of guards led the conference with an impressive 112.6 efficiency and Fresno State was bottom at 95.7. Under Larry Shyatt Wyoming is thought to play strong defense and the numbers above illustrate that with the Pokes ranking fourth in the Mountain West and 84th nationally in defensive efficiency. As with the offense this year’s numbers were a downgrade from last year where Wyoming was thoroughly excellent posting a 91.1 rating good for 12th in the nation. The surprise on this list to me is UNLV who is known as a team that likes to get up and down the court but pays no attention to defense. This perception is off-base as the Rebels were number one in the Mountain West and 18th nationally in defensive efficiency which makes their first round NCAA tournament exit even more mind-boggling. When you put the two charts above together you can gauge the quality of a team by looking at their efficiency differentials. 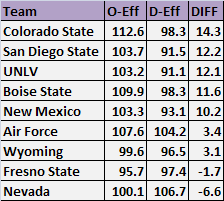 Every team in the Mountain West with an efficiency differential over ten received a bid to the NCAA Tournament. Now that is just a one-off observation that has no true statistical meaning and there are sure to be exceptions to the rule but offensive and defensive efficiency are key factors in determining the overall strength of a team. With these numbers in mind, the question has to be what does this mean for Wyoming? I don’t want to beat a dead horse but as with the plus minus breakdown the same conclusion can be reached here. The loss of Luke Martinez to suspension/injury was a huge blow to the team. If Martinez were available all season it is safe to say Wyoming would have posted similar efficiency numbers to last season considering Martinez was Wyoming’s best player offensively and is regarded as Wyoming’s best perimeter defender. Wyoming’s lack of depth meant that underclassmen had to play increased minutes and they were not nearly as productive on both ends of the floor as Martinez would have been. This should bode well for the future though because Adams and Grabau should both improve their games and be among the most experienced players in the Mountain West once they are upperclassmen.